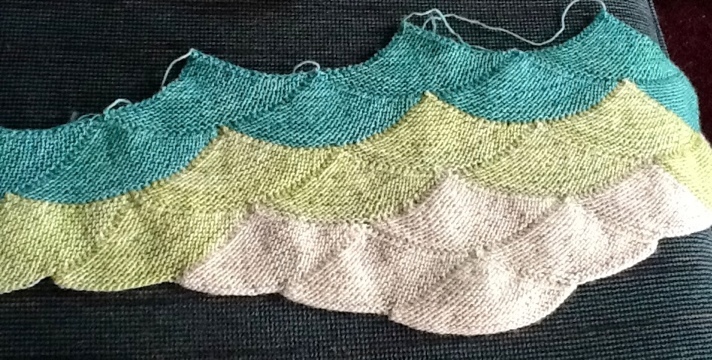 I’ve been steadily progressing on the Aranami shawl. Which after looking at last night I’m going to get nowhere near the size the designer did. Yes I used different yarn but used same needle size. My gauge was about half of hers. So maybe after all my loose knitting on other items, these were tight? Doesn’t really matter except that I won’t really be able to wear this as a wrap around scarf like I like. It’ll be more of a shawlette. I have one last color and hen I’ll be done. If I can get some serious knitting in this weekend, then maybe, but I’m not going to push it. I’ve had a lot of arm muscle fatigue lately when I knit too much. 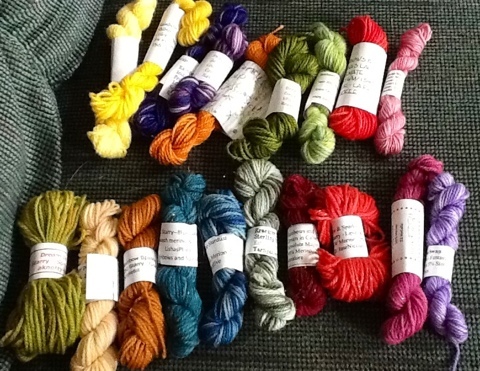 I also received a bag full of minis yesterday, which reminds me I need to get back to that darn blanket! The theme was rainbows and sparkles. About half the minis are sparkles I was surprised there weren’t more. Anyway the bottom half are the sparkle yarns although in he pic you don’t see it so much. Love the sparkles! !